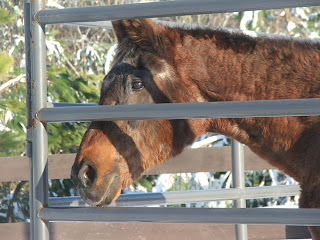 "When To Call The Vet"
Last weekend, we were confronted by a normally ravenous mare who had turned her nose up at two of her last three meals. A quick check showed her temperature to be 103.1, prompting a Sunday morning emergency call to our vet clinic. While we are still treating what seems to be a viral infection, we feel initiating immediate treatment, even on a Sunday, spared this mare further complications. As a responsible horse owner, it is imperative that you are able recognize an equine emergency, know when to call the veterinarian, and are prepared to handle the situation. The goals of this article are to help you appreciate the severity of the situation, respond promptly, and be prepared for your veterinarian and able to take control prior to his/her arrival. There are several key pieces of information that should be close at hand at all times so that during an emergency there is no time lost. The most important is your veterinarian’s office number and after hours/emergency number. It is also helpful to have directions to local referral/surgical centers on hand as well as the contact information for friends, family members, or a professional trailering service that can trailer your horse for you if you do not have access to a trailer. Educating yourself about the expense of referral procedures (e.g. colic surgery) and having a plan for each horse can also make an emergency situation less stressful. 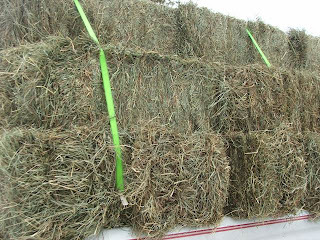 It is critical that your horses be well trained and comfortable loading and trailering. 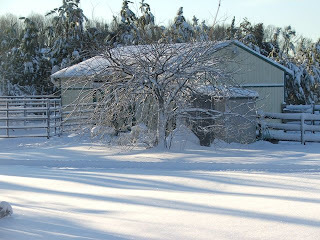 It is likely that if the emergency is severe enough that a trailer ride to the veterinary clinic or referral center is required, both you and your horse will be stressed. Therefore, it is helpful in these instances that trailering not be an additional hurdle for you. 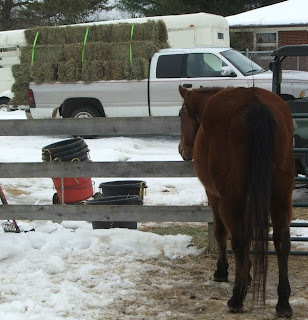 If your horse has difficulty trailering or has never been on a trailer, there are many trainers that can offer advice and come to your farm to work with you and your horse. Knowing your horse’s normal vital signs is an integral part of determining the severity of an emergency situation. This information is also beneficial to have when making an emergency phone call to your veterinarian. Having a well-stocked first aid kit on hand is an additional benefit during an emergency (see attached information sheet on first aid kits). Below is list of common emergencies you may be confronted with as a horse owner. Colic is a general term for abdominal discomfort. The signs of colic can range from subtle to severe. These signs include but are not limited to the following: depression, decreased appetite, laying down, stretching, pawing, kicking at belly, rolling, thrashing. If you notice your horse showing any of these signs, call your vet immediately. Be prepared to describe your horse’s behavior, his last bowel movement, his recent appetite, and his rectal temperature (if you can safely get a reading). Before the vet arrives, stay safe! Do not attempt to rouse a horse if he is violently or uncontrollably thrashing. 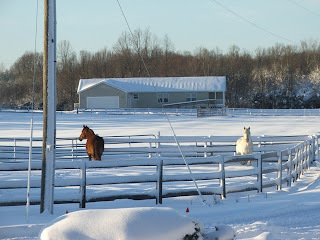 Do not offer your horse any feed, hay, grass or water, and keep your horse up and walking if you are able to safely. Administer medication ONLY if advised by your veterinarian. A laceration is a full skin thickness wound. Puncture wounds are often less obvious than large lacerations but can become severely infected if overlooked or untreated. Therefore, it is critical to evaluate your horse thoroughly from head to toe daily, paying special attention to any swelling, lameness, or evidence of wound. Before the vet arrives, catch and calm the horse, get assistance if possible, evaluate the wound, clean with water only, stop any bleeding, and call your veterinarian. Since each situation is different, these steps do not need to be followed in any strict order. REQUIRE IMMEDIATE ATTENTION! Call your veterinarian as soon as an eye issue is identified. Signs of ocular pain include holding the eye closed, tearing, and squinting. Be sure to note any swelling of the lids or any external injuries. Before your vet arrives, prevent your horse from rubbing the affected eye. Keep your horse quiet and place a warm compress over the affected eye (if the horse allows). 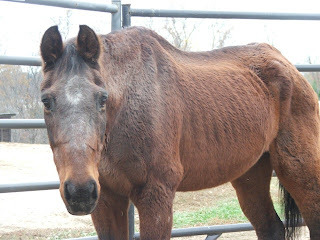 Severe lameness that comes on suddenly can be very serious. As a result, it is imperative that you call your veterinarian immediately. A non weight-bearing lameness could be as simple to diagnose and treat as a foot abscess but is important to differentiate from a fracture or nerve damage. 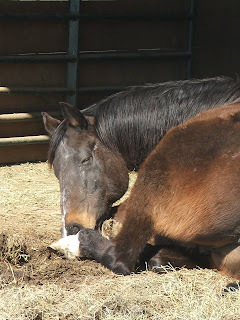 Bilateral forelimb lameness (both front limbs) or reluctance to move forward could be a sign of founder (laminitis) and requires immediate and intense treatment. Before the vet arrives, keep your horse quiet, check the limb(s) for signs of swelling or heat, check the foot for evidence of a nail or puncture. 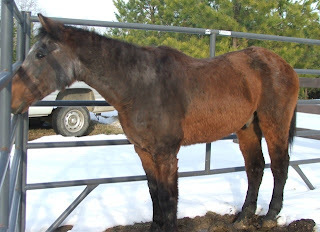 If there is marked swelling and the horse will remain quiet, you may cold hose the limb. If you find a nail or other foreign body in the foot, keep the horse quiet but do not remove the foreign body. It is helpful for your veterinarian to see the nail, etc and perform radiographs with it in place to identify what structures may be involved. 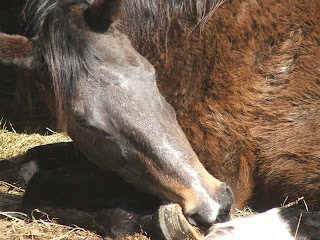 Choke in horses describes an esophageal obstruction (obstruction of the food pipe). Signs of choke include food-stained saliva coming from the mouth of nostrils, an outstretched neck, and oftentimes coughing. Call your vet immediately if you notice any of these signs. Before the vet arrives, keep your horse quiet and in a stall. Do not offer feed, hay, grass, or water. An abortion in a horse is defined as a dead or dying fetus expelled < 290 days of gestation. Once an abortion is underway, it is unable to be prevented or stopped. However, due to some of the potential causes of abortions (infectious disease), it is important to isolate the mare and place the fetus and membranes in a plastic bag. Store the remains in a cool place away from dogs and wild animals. It is also good practice to discard the bedding and disinfect the stall. Call your veterinarian to examine the mare and check for any signs of retained placenta or systemic disease. Normal foaling occurs within minutes, so any problem (dystocia) is an urgent emergency. Call your veterinarian if it is greater than 15 minutes since the water breaks and there is no foal on the ground, if there is only one leg protruding after 15 minutes, or if there is a “red bag” (whole placenta coming with foal. This will require you break open to placenta so the foal can breathe. Your veterinarian will guide you through this over the phone because there is no time to spare!). Several causes of a horse that is down and unable to stand on its own are as follows: complications of old age (arthritis, muscle wasting), malnutrition (weakness), fracture, neurologic problems, drug reactions, illness. 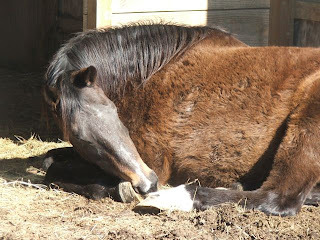 Because horses are such heavy animals, prolonged recumbency can result in irreparable damage to the lungs and muscles. 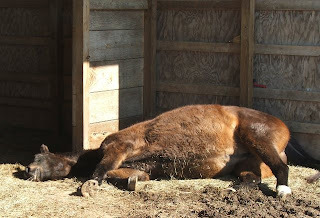 Horses often struggle when they go down and can rapidly become exhausted if they are not roused quickly. As a result, it is imperative to call your vet immediately. Before your vet arrives, keep the horse as quiet as possible, clear the area of any debris that may obstruct rousing the horse, and most importantly, stay safe! Be sure to approach horse from its back or head and stay away from its thrashing feet. If you find your horse having seizures, call your veterinarian immediately and STAY SAFE. Stay out of the stall with the horse to prevent from being hurt. There are a variety of different signs of illness that include lethargy, decreased or no appetite, fever, and diarrhea. If you notice any of these signs, call your veterinarian immediately. It is important to keep in mind that this is just a list of the most common types of equine emergencies. Do not hesitate to call your veterinarian at any time if you have a question about your horse. It is also a good idea to develop a good working relationship with your veterinarian during routine examinations, vaccinations, etc. prior to an emergency situation. He or she will be happy to work with you to prepare for an emergency. Many accidents can be prevented by taking the time to evaluate your horse’s environment and removing potential hazards. Mentally rehearse your emergency action plan. In an emergency, time is critical. Don’t be concerned with overreacting or annoying your veterinarian. By acting quickly and promptly, you can minimize the consequences of an injury or illness. For more information about emergency care, ask your equine veterinarian for the “Emergency Care” brochure, provided by the AAEP in partnership with Educational Partner Bayer Animal Health. 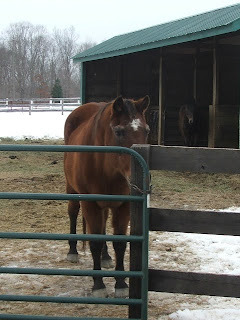 More information can also be obtained by visiting the AAEP’s horse health web site, www.myHorseMatters.com. Seems to be time for a gentle reminder to leave certain feelings at the gate when visiting the residents of Traveller's Rest. Our residents may be elderly and have special health considerations in most cases, but all are still vital, perceptive representatives of the equine world. Remember that horses are very sensitive to their handlers' moods and emotions. When you work with a horse and focus on past mistreatment or current health issues to the extent that it causes obvious anger or anxiety, the horse picks up on those emotions. Very often, anxious handlers cause horses to be anxious as well. In trying to keep our residents' environment stress-free, we ask that visitors focus on more positive aspects of the Elders' present lives. Focus on progress they've made, whether that progress is measured in leaps or in baby steps. If hearing stories of past treatment causes anger, or if you cannot look past issues yet to be resolved, let us know and we will help you find another horse with which to spend your time. Anger and anxiety are understandable reactions to certain situations, but neither benefits the Elders. Is Sherman fully "rehabbed?" Not yet. He needs to put on a few more pounds and there are still some issues requiring further diagnostics, but the baby steps are piling up. A lesson in patience for those of us who wanted him to recover at a faster pace, but Progress none the less! Jubal's usually a pretty non-reactive sort of guy. What prompted this much interest? "Now, if I could just levitate a bale a or two..............."
After more than a week, Mona resumes her late morning naps. This is the first time we've seen her sleep in a shed rather than out in the open, but when you're this tired, you catch some ZZZZ's wherever you can find a spot! A piece in Harmony Horseworks' latest newsletter sums up, perfectly, our thoughts on this subject. HH managed to put into words something we've frequently thought about, but never fleshed out in writing. Please read "COMPASSION AND ACTIVISM EACH HAVE THEIR PLACE" in their February 2010 newsletter. Yes, I know. Blog posts have been few and far between lately. 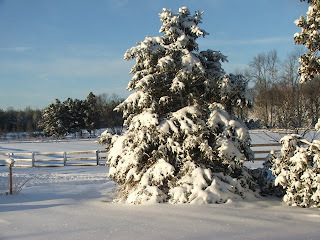 The absence has been due (in case anyone missed this) to weeks and weeks and weeks of record breaking snowfall in Virginia. More work outside = less writing. As the snow melts, we'll begin (again) to battle mud and flood. Eventually, we will return to our regularly scheduled programming, but for now, please remember you can visit TREES' Facebook page for short updates and news blurbs. We hope everyone came through the storms without too much loss and that all are well. These shots were taking during our 3-day "Snowmageddon" power outage. Another storm is expected today, bringing sleet and possibly another 5-10 inches of snow, so we're going to be filling all the water containers we can find again.